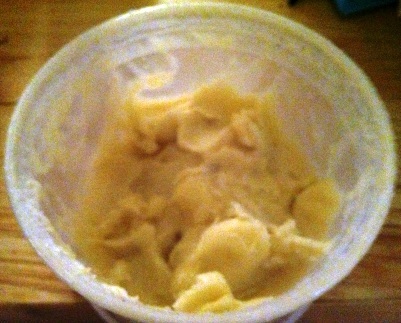 A friend of mine introduced me to the wonders of Raw Shea Butter . I have found that this is my best hair product to date. Since using, my hair is never dry and it looks fantastic. She gave me a slab of Shea Butter that she had stored in a box in her house. I took the slab and placed it in a blender with some Vitamin E Oil , Jojoba Oil , Coconut Oil , and a little of my Shea Moisture Coconut & Hibiscus Curl & Hold Smoothie . It blended into a nice, smooth hair product that I scooped out and put in an empty container. I LOVE, LOVE, LOVE this product and it is much cheaper than many of the ready made hair products I buy. I take a small amount and add it to my hair, focusing on my ends, each night. I plan on buying a 5 lb box of this stuff before I run out of my current stash. It works great on my daughter’s hair as well. I have been placing her hair all summer in two low braids (very easy style). This product makes it much easier to brush and detangle the hair and get it to a point where I can grab and braid in two pieces. She has a ton of hair that is not easy to get into two of anything!